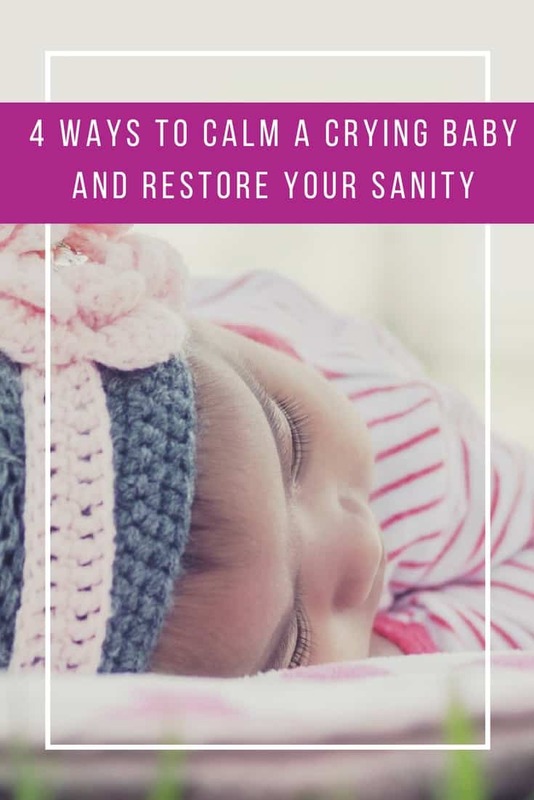 Home > Wellbeing > 4 Ways to Calm a Crying Baby and Restore Your Sanity! Does it feel like your baby is always screaming? When your little one is fractious and can’t settle it can be upsetting for you too. If you’ve tried everything you can think of to settle your baby and they’re still crying then read on to discover some lavender essential oils uses for babies to help calm your crying baby. I have a vivid recollection of a Sunday when my babies were still very young when they both screamed and screamed for the entire day. My husband and I tried everything from feeding, to rocking, to changing bottoms, to singing and everything in between. But the screams just got louder and louder and my hubby and I got more and more tired and frustrated. Finally at about six in the evening we couldn’t bear it any longer and feeling like a complete failure I picked up the phone and called my mum. Through my tears I told her that we couldn’t stop the babies from crying, and five minutes later she was on the doorstep. Hubby and I were bundled off to bed for some much needed sleep and the screaming babies were quietened in minutes by Nanny and Granddad. Turns out the magic touch that day was being calm. I don’t think there was anything wrong with either baby, I think that throughout the day they had fed off our growing frustration which had led them to become more and more fractious. And the more fractious they became the more frustrated we became and it just went round and round in a vicious circle. Since then I’ve learned that the key to a calm and happy baby is a calm and happy mother! There are lots of things you can do to help keep you and your baby calm and happy, but one of the easiest ways – and the nicest smelling – is to use Lavender essential oils. Here are some super simple ways you can use Lavender essential oils with your baby and yourself to maintain some peace and calm in your home. Baby massage itself is a wonderful way to connect with your baby and to help them settle. You can mix a few drops of Lavender essential oil with a carrier oil like sweet almond oil, or even an unscented body lotion to make your own lavender massage oil. We took a class when the kiddos were about 8 weeks old and it was one of the best things we did! If you can’t take a class then the video below from Johnson’s Baby is a great way to learn. Invest in an essential oils diffuser for your baby’s room, there are some wonderful light changing ones available that are really calming to watch. Diffuse a few drops of Lavender essential oils during nap time and before bedtime to help your little one get a good sleep. It’s a really good idea to put a diffuser in your own room too to help you get the best night’s sleep you can, especially if you’re still having to wake in the night to feed your baby. This is a great way for mom and baby to stay calm. Add 2-3 drops of Lavender essential oil to your baby’s bath to calm and soothe them before bedtime. And when baby is sleeping you can add 5-10 drops to your own bathwater to help you relax too! There is nothing worse than trying to concentrate on driving when your little one is screaming blue murder in the back seat! Keep everyone calm by sprinkling a few drops of lavender onto your baby’s car seat. Next PostNext How to Save up to $4500 to Pay for Your Disney Vacation in Just One Year!